Trail cams can provide as much invaluable information during the season as they can during pre-season scouting. The leaves were already starting to change colors the first time I got a picture of him. Since mid-July I had been running multiple scouting cameras across the 210 acres I was hunting, and he hadn’t been captured in any of the more than 800 pictures I had logged. The property extended for nearly 2 miles along a meandering creek bottom, surrounded on both sides by expansive crop fields and the occasional woodlot littered with hardwoods. This created thousands of hidey-holes in which this buck could seek refuge, but his sudden appearance still surprised me. Hundreds of scouting cam pics and hours of in-field summer scouting—not to mention hours of early season hunting—hadn’t turned up so much of a track from this buck. But there he was in all his glory, suddenly flaunting in front of multiple cameras. And the kicker? He was big enough to reroute my previous game plan and shift my focus directly to tagging him. There are multiple reasons why whitetail buck might relocate, but rather than focus on why he arrived, change your perspective to determine why he might’ve left where he’d previously been living. Any deer hunter who’s been in the woods for more than one season knows that the rut does crazy things to a whitetail’s schedule and travel routes. No surprises there. But the buck I referenced above showed up during the portion of the season when deer typically don’t wander. The often less than exciting time as bucks shift from their highly predictable summer patterns to the movement halt of the October lull. There can be many reasons for mid-season movements depending on your specific locale. However, if you can put your finger on why a buck might relocate, you can then determine what he’s seeking, or what he’s avoiding, and plan your strategy accordingly based on what your trail cameras are telling you during your continued scouting throughout the season. For example, food sources favored by whitetails change constantly throughout the hunting season, most often dictated by the weather. An early frost can quickly alter a favored soybean field and push deer to a new primary location. Same goes for your food plots. Keep the cameras rolling all season and you’ll have tangible proof of deer movements rather than simply guessing if they’re favoring one food plot or another. In areas consisting of large agricultural fields, I’ve found the cutting of cornfields to be one of the biggest influencers of deer movement. Throughout the summer months, and continuing into early fall, whitetails do not need to travel far at all if they have everything they need for survival, and a cornfield provides two of the big three necessities: cover and food. Add in a quick trip to a nearby water source, and I’ve seen whitetails limit their daily travels to as little as about 100 yards. Similar seasonal patterns can be found in whitetail locales consisting of a lot of CRP fields. When the grasses are growing, cover is ample and there are many escape routes for mature deer. 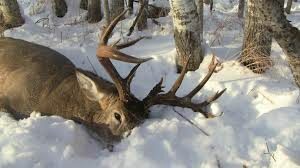 But as the season progresses, especially if a snowstorm rolls through, cover quickly becomes limited and deer are forced to relocate. Of course, the biggest factor to influence deer movement is people movement. From farmers to hikers, and from hikers to hunters, it’s no secret that deer will rarely tolerate pressure from people. As simple as it sounds, deer that leave one area have to go somewhere else. Whitetail knowledge will oftentimes give you a good starting point about where they’ve gone, but a trail cam will let you know for sure. Working a line of trail cams throughout the season can be a risky venture. More cameras mean more eyes in the woods feeding you information, but they also mean more intrusion to pull memory cards. I’ve found it extremely effective to check my trail cams after an extended morning sit. I’m already in scent-minimization mode, I’m already in camo and I’m already in the woods—so it logistically makes sense. I do, however, plan my route carefully, minimizing the amount of distance I must travel to check all the cards, but I’m also very careful to travel downwind of bedding areas to minimize the potential for spooking deer in their late-morning beds. Is the risk worth the reward? Absolutely. Information has proven to be the key to consistently tagging mature deer, and the information I gather while hunting, on combination with trail cams watching my blind spots all season long, maximizes information intake.